Cash bar opens at 5 PM; dinner served at 6 PM. Reservations, Call Bernice at 412 335-2780 by November 22 . 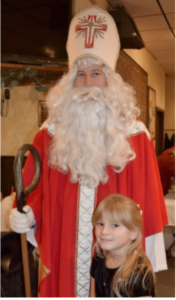 Come and celebrate the Annual St. Nicholas Day Banquet to be held Saturday, December 5, at Javor Hall. Enjoy a sumptuous catered, hot dinner buffet by Nova Cafe with homemade desserts and hot beverage while being serenaded by the fabulous Mikey Dee Band. Join in a sing-along of beloved, traditional Croatian Christmas carols led by former choir members of St. Nicholas Church accompanied by the ever famous, Mikey Dee Band. We welcome Javor Pittsburgh ensemble back this year and look forward to another outstanding performance as they sing and play Croatian tamburitza melodies. The evening will continue with dancing to polkas and kolos, as well as socializing with family members and friends. St. Nicholas will be making an appearance and greet each guest with a special treat. There will be door prizes too. 6 PM. This event booked quickly last year, so make your reservations early. Call Bernice at 412 335-2780 by November 22.